Senegal captain El Hadji Diouf has announced he will no longer play international football for his country. The 26-year-old striker said he had been frustrated by organisational problems with the West African side. "The team has a scheduled friendly match in a week and we don't even know who we are playing against." Diouf, who plays for Premier League side Bolton Wanderers and has played for his country over 30 times, added: "This is unacceptable." "If we have to come and play for our country, we have to pay for our own air ticket and reimbursement of the cost is another big problem," he added. 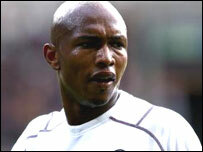 "I don't think I will change my mind," Diouf said. The outspoken player was due to lead Senegal at next year's African Nation's Cup in Ghana after the Teranga Lions qualified for the finals. Senegal are due to play Guinea in an international friendly on 14 October in Paris, France. Bolton Wanderers have stated they are unaware of the players intention to retire.